The Chicago-based Cook County Health & Hospitals System's financial well-being next year relies heavily on money flowing from its CountyCare health plan, which is projected to swell about 60 percent under a new Illinois Medicaid contract. The health system expects CountyCare, a Medicaid plan launched in 2012 under the Affordable Care Act, to generate $1.2 billion in the fiscal year that starts Dec. 1, up from about $800 million this year. Next year, CountyCare dollars will make up about 62 percent of revenue the system generates, from about 55 percent this year, according to Cook County Health's preliminary budget released Aug. 25. The budget relies on another $235 million of revenue coming from the county, including dollars from the controversial sweetened beverage tax, to cover pension contributions and shortfalls. The health system this year was roughly 40 percent of the countywide budget. Managing expenses will be key. They're projected to climb about 24 percent, totaling $2.4 billion, though the health system expects to break even at the end of 2018. The higher spending is mainly due to a projected boost in CountyCare enrollment (to about 225,000 people, from 141,000 now) as part of Gov. Bruce Rauner's overhaul of a Medicaid cost-saving initiative. CountyCare was one of six insurers to win bids in Rauner's revamp, which further privatizes Medicaid. Dr. John Jay Shannon, CEO of Cook County Health, is putting together his financial road map at a time of high anxiety among hospitals chiefs nationwide. President Donald Trump and Republican lawmakers repeatedly have tried to dismantle the ACA, which insured an estimated 20 million people, helping hospitals get paid for many patients they already were treating for free. Meanwhile, Trump wants massive cuts to Medicaid, which expanded under the ACA. "You obviously have to hope for the best and plan for the worst," Shannon said. If Medicaid is stripped at the federal level, the county could stand to lose between $300 and $800 million. Cook County also is grappling with a rise in uncompensated care—that's the amount of free treatment the system provides, plus debt accrued from patients who skip out on paying their bills. In fiscal year 2017, which ends Nov. 30, the tab is expected to reach close to $503 million—surpassing $500 million for the first time since 2013. Doug Elwell, deputy CEO for finance and strategy at Cook County Health, attributes the increase to a few factors. People who don't pay their bills because they can't afford their deductibles, but also people who can't afford their monthly premiums, so they end up seeking free care. The cost of providing treatment in general is more expensive. "Because we're getting more efficient with treating people, we have been able to take on more patients," Elwell added. 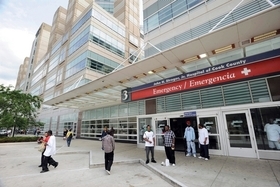 Cook County Health is one of the largest public hospital systems in the nation, encompassing flagship Stroger Hospital on the Near West Side, Provident Hospital on the South Side and a network of clinics. The system averages more than 12,000 emergency room visits a month. As hospitals across the country look to woo patients at more convenient, less expensive facilities, Cook County Health has focused on beefing up its outpatient services. Among the system's 2017 highlights: making progress on a slew of capital projects, including a long-awaited outpatient center on the Stroger campus. Another highlight: bolstering mental health and substance abuse services, including giving an overdose-reversing drug to departing Cook County Jail inmates, and winning the new state Medicaid contract. Heading into the next fiscal year, Shannon's challenge will be to control costs in CountyCare. The plan involves hiring more coordinators to keep close tabs on patients to prevent pricey ER visits and hospitalizations. The system also is taking a page from its doctors about how to ward off ailments in the first place. Cook County Health is teaming up with Maywood nonprofit Housing Forward to provide 33 housing units in the Chicago suburbs for patients, the idea being that having stable housing leads to better health and therefore lower medical costs overall. Through 2020, Cook County Health projects that the subsidy from county taxpayers will remain around $110 million. It's projected to be around $105 million by the end of this fiscal year. The Cook County Board must approve the health system's budget this fall. "County​ health​ system​ outlook​ in​ 2018:​ More​ Medicaid​ patients,​ more​ revenue"​ originally​ appeared​ in​ Crain's​ Chicago​ Business.